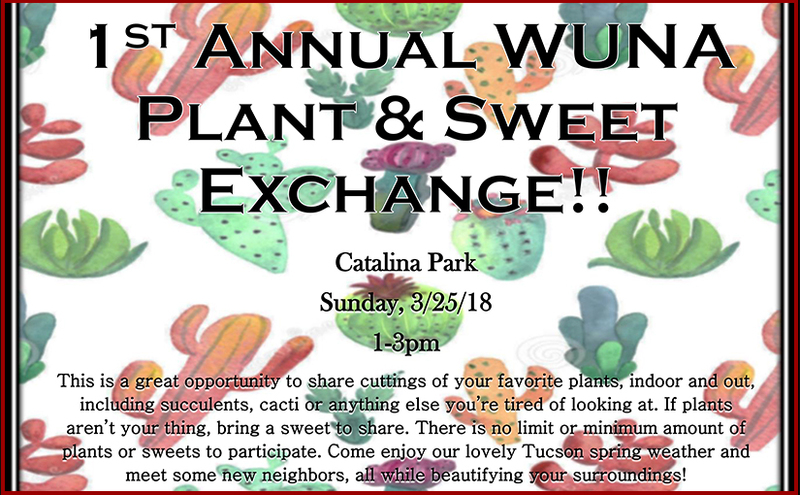 This is a great opportunity to share cuttings of your favorite plants, indoor and out, including succulents, cacti or anything else you’re tired of looking at. If plants aren’t your thing, bring a sweet to share. There is no limit or minimum amount of plants or sweets to participate. Come enjoy some lovely Tucson spring weather and meet some new neighbors all while beautifying your surroundings! Area residents, Learn the details of a newly proposed student housing project to be built on the southwest corner of 4th Ave. and 6th St. by the student housing developer EDR from Memphis Tennessee. The Project will use the Infill Incentive District Optional Overlay (“IID”) standards to redevelop the current infill property, and the Project will include approximately 253 residential units, along with ground-floor commercial/office uses and associated parking. You are invited to attend the meeting, provide feedback, and ask any questions you may have. The Annual WUNA meeting and neighborhood gathering potluck is January 21, 2018, 1pm, at Catalina Park. You do not need to be a property owner – everyone is welcome! This will be a potluck with the association providing the plates, cups, and beverages. Our annual meetings provide the opportunity for new and old residents to meet and together to decide important matters for the organization to concentrate on next year. We will elect officers and area representatives. All the officer positions are open, and it is important to have new energy and new ideas, so please volunteer to take a part in helping to maintain the special character of our historic neighborhood. We ask dues of $10 a household to help maintain the website, post office box, and other incidental expenses. Need help with our beer booth at this weekend’s Street Fair! It’s Street Fair time and WUNA has the semi annual beer booth to raise funds for neighborhood projects. Typically we have filled our work slots by now, but a fraternity has has not come through and a couple of people have gotten sick. We are in need of 2 people for the Saturday Dec. 9 afternoon 1:30 to 5pm, and 1 person for the Sunday Dec. 10 afternoon 1:30 to 5pm time. It’s a fun way to meet and work with neighbors. The booth location is the north east corner of 4th Ave and 5th St. You can sign up via Doodle or respond to Jack by email. Tucson’s Tugo Bike Share Program Launches! 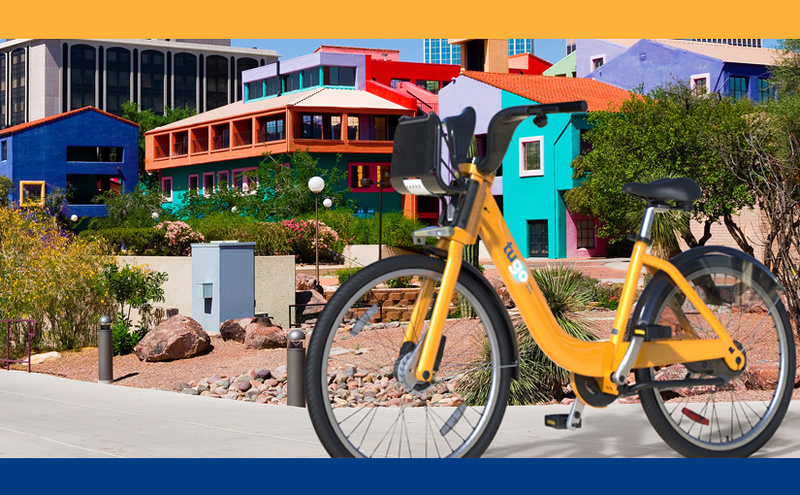 You are invited to the launch of Tucson’s tugo bike share program! Tugo Bike Share is a network of bicycles and stations designed for short, one-way bicycle trips and the City of Tucson’s newest commuter transportation option. Tucson’s Tugo Bike Share program launches Friday, November 17, with 35 stations and over 300 bicycles. The event runs from noon until 2pm, with an official kick off at 12:30 p.m. at Catalina Park, 900 North 4th Avenue, with Mayor Jonathan Rothschild as emcee, and concluding with the first group of tugo bike share riders heading off to one of the self-service, solar powered stations in the downtown and university areas. Local radio station KRQ/93.7 will provide music. Light refreshments will be provided during the event. Tickets are $10 for an all day pass which grants entry to all six Forum tracks and the post event cocktail reception.